Have you been thinking about buying an electric car, but find them too assembled for your tastes? 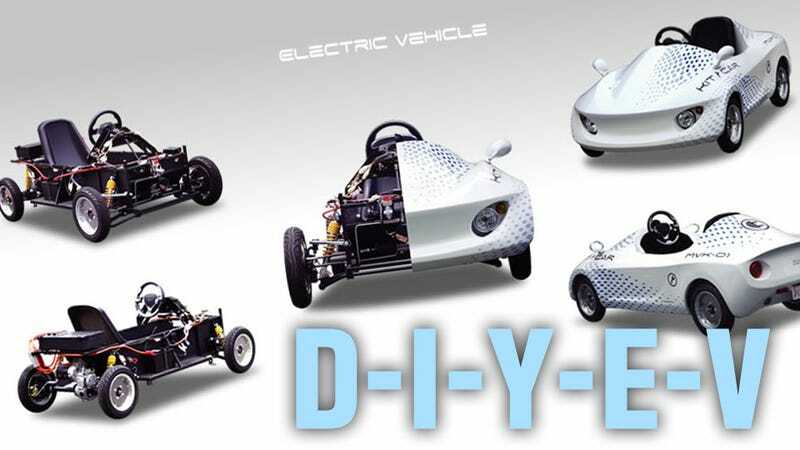 Then boy are you in luck: a Japanese company called Modi-Corp has released a new, assemble-it-yourself electric car. The car is a tiny one-seater vehicle, street-registrable in Japan as a "motorized bicycle", and, in a brilliant triumph of confusing marketing, is called a Pius. You know, since there's no other electric or partially electric car named something that sounds really, really like "Pius." Based on a Japanese chart, it appears to have a range of about 15 miles (25 km) and a top speed of close to 22 mph (35 kph). This blistering speed is thanks to a just under 1 HP motor (0.6 KW), fed by a 36 V battery pack, and pushing around all 440 lbs of car. These specs make it remarkably similar to the Electra King I reviewed recently. The modest specs of the car are quite forgivable when the purpose of the car is understood. It's designed to be sold to schools and universities so the technology of electric cars and their construction can be understood. From this perspective, it seems terrific. The chassis looks to be a practical rear-motor design, with battery packs placed above the front axle and on either side of the central seat, with the motor control unit above the rear motor/transaxle assembly. It's skinned with an attractive, sporty body made of what I'm assuming is plastic, and available in six colors. Any class that involves the creation of a working vehicle of any sort is okay in my book, and this one looks like it'll make a pretty great go-kart as well. Schools buying these should get in touch with each other to set up a race series as soon as possible.